This Jack Daniel's rib glaze is a sweet and sticky sauce to be applied to ribs, whether grilled or smoked, shortly before they are finished. If you make the rib glaze one to two days in advance, the flavors will have more time to blend together. This sauce is high in sugar content and sugar can burn at higher grill temperatures. Applying the sauce only to finish the ribs keeps the sugar in the sauce from burning while letting the sauce form a rich glaze over the surface of the meat. Feel free to serve some extra on the side, but be sure to warn any guests who wish to avoid alcohol. Jack Daniel's Tennessee Whiskey was first distilled over 150 years ago and is produced in Lynchburg, Tennessee. It is filtered through charcoal and aged in charred oak barrels, lending it a smoky quality. The company also makes its own line of bottled barbecue sauces, including a barbecue glaze and a honey barbecue glaze (made with their Jack Daniel's Tennessee Honey Liqueur. In a medium saucepan, combine the ingredients (whiskey, ketchup, dark brown sugar, vinegar, lemon juice, Worcestershire sauce, minced garlic, dry mustard, salt, and pepper) and mix well. Simmer over medium-low heat for 20 minutes, stirring often. Reduce heat to low if needed. Make sure to keep a close eye on this sauce as it cooks. The sauce should be thick by the end of simmering. Remove the sauce from the heat and allow it to cool completely for about 15 to 20 minutes. Use immediately after cooling or store in an airtight container in the refrigerator for up to seven days after preparation. Warm the refrigerated sauce on the stovetop for a few minutes before using. Apply to grilled or smoked ribs as directed. While simmering the sauce for 20 minutes will reduce the alcohol content, it will still retain about 40 percent of the alcohol originally in the whiskey. When you use it to glaze the ribs, most of the remaining alcohol should be evaporated. 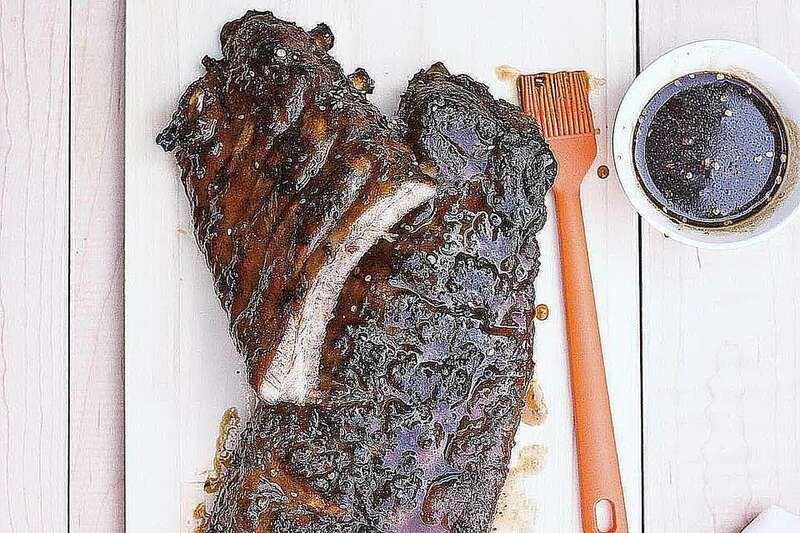 If you are serving the rib glaze as a side sauce, it will still have some alcohol. If you are serving anyone who does not wish to be exposed to any alcohol (those in recovery from an alcohol use disorder, pregnant women, those with religious restrictions), provide an alternative sauce. If you are taking the glaze to a gathering as a side sauce, provide a label showing it is a whiskey sauce and has alcohol.